Patricia Robcke was appointed Town Comptroller July 21, 2015, after serving as Deputy Comptroller for 22 years. The Town Comptroller provides overall management supervision of the financial activities of the Town under the direction of the Supervisor and Town Board. The Comptroller’s Office is responsible for meeting the many challenges of financial reporting, including the preparation of the comprehensive annual financial report (CAFR). 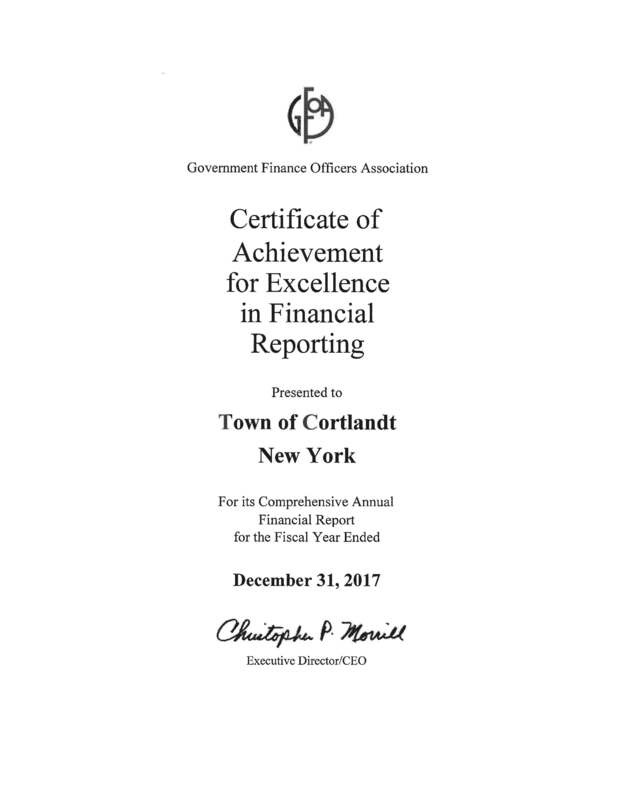 The Town of Cortlandt has received a Certificate of Achievement for Excellence in Financial Reporting, presented by the Government Finance Officers Association of the United States and Canada for the Fiscal Year Ended December 31, 2016, and each year prior as far back as the 1980’s. The Town of Cortlandt and the Comptroller’s Office are proud to have achieved the highest standards in governmental accounting and financial reporting. FOR MORE INFORMATION ABOUT THE town comptroller- PLEASE CLICK ON PAGE NAVIGATION ON THE UPPER RIGHT HAND CORNER AND VIEW THE DIFFERENT DROP DOWN MENUS.